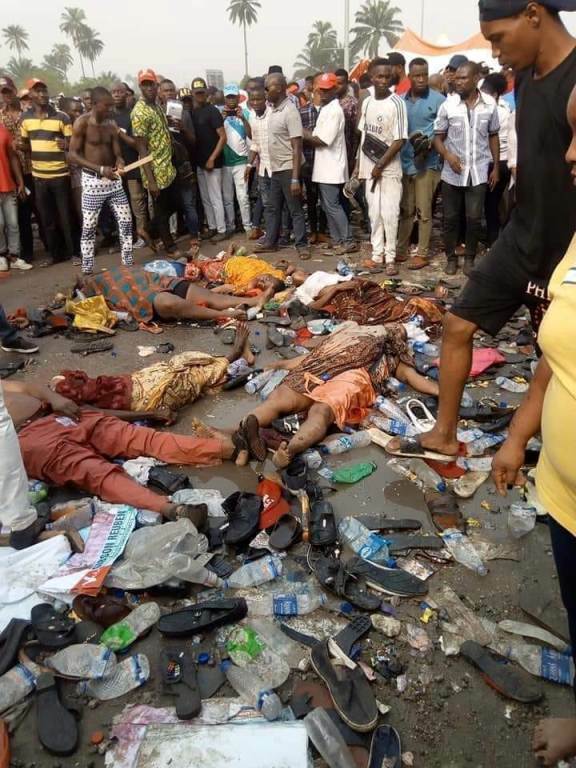 At least 12 persons have dead in the stampede that occurred at the All Progressive Party (APC) campaign rally at the Adokiye Amiesimaka Stadium,Igwurita on Ikwerre local Government Area of Rivers state, Nigeria Revelation Agents has learnt. We gathered that the stampede occurred as party faithful and other visitors were about leaving the venue after President Muhammadu Buhari,the candidate of APC in the 2019 elections who came for campaign left the place to Bayelsa. Nelson Ogbuji APC ward 18 unit 17 leader in Port Harcourt local Government area told Revelation Agents that the incident occurred very close to the exit gate of the stadium and many of the injured persons was admitted at the University of Port Harcourt Teaching hospital (UPTH) while the dead victims have been deposited in the mortuary Meanwhile Rivers State Government has commiserated with families of those who lost their lives during the stampede.A statement by the Commissioner for Information and Communications Barr Emma Okah says these deaths at a time like this are very unfortunate and deeply saddening.”It is a sad development and we share the pains of these families. It is possible that this ugly situation would have been avoided if the organisers had taken some basic precautions relating to crowd management in a gated environment” Okah said, noting that this bitter lessons like this should not be the portion of Rivers people again irrespective of the political party they belong to.